This White-handed Gibbon contemplates the day. Painted storks are abundant in SE Asia. This one was with an opportunistic wild flock that has taken up residence in the Korat Zoo in Thailand. This may be a Southern Painted Stork, a/k/a Milky Stork with a Painted Stork in the background. Time to consult the filed guide! This pooch settled in at the base of a Spirit House outside the temple in Phnom Penh and looks suspiciously like the dog from my New Delhi post Sleeping Dog. Will Dog appear in Thailand? I recently visited Phnom Penh, Cambodia, for a conservation workshop on saving the Eastern Sarus Cranes and the wetlands they need to survive in southeast Asia. One evening our group visited a temple near the hotel and we met this little female long-tailed macaque. She and her sister were digging into the fruit found inside lotus flowers, originally brought to the temple as offerings. 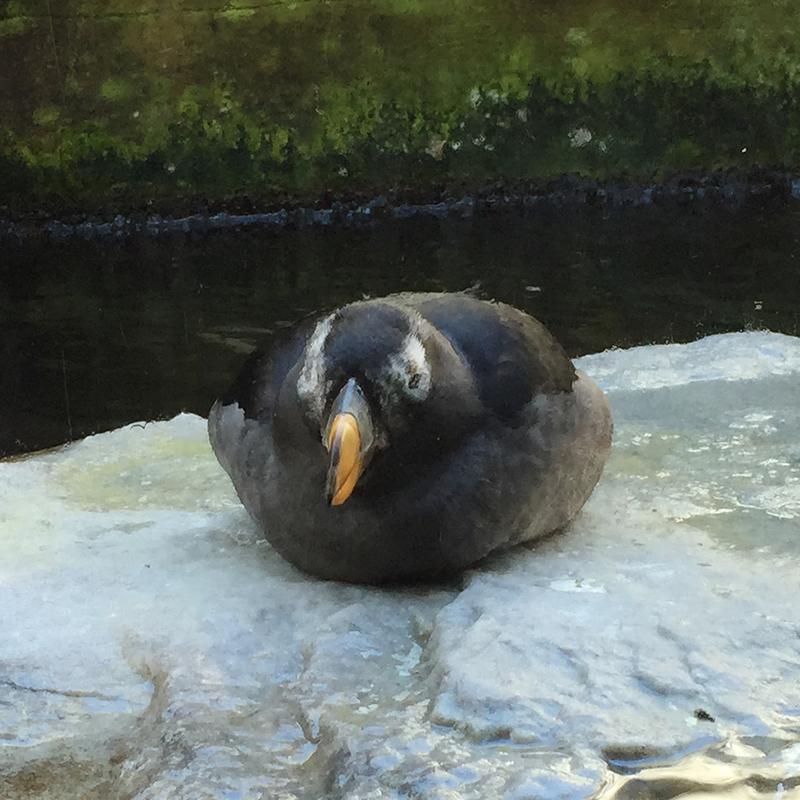 These photos were taken through glass at the Seattle Aquarium, giving the images a painterly effect. 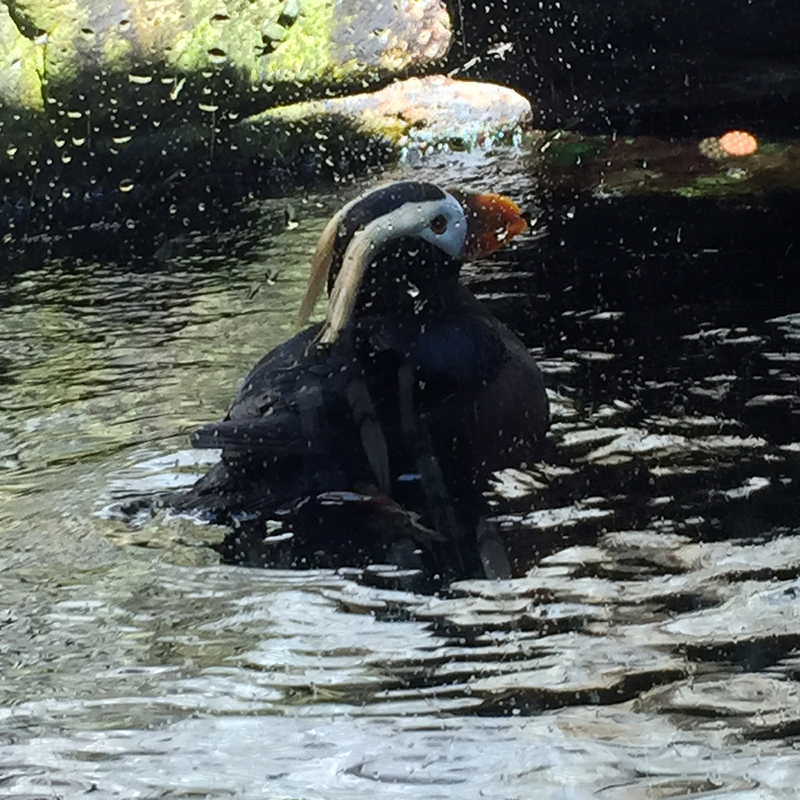 Both are Tufted Puffins, the bird at the top is in non-breeding plumage, giving it a more drab appearance. Click on the photos for larger images. Anemones & Urchins & Corals…Oh My! 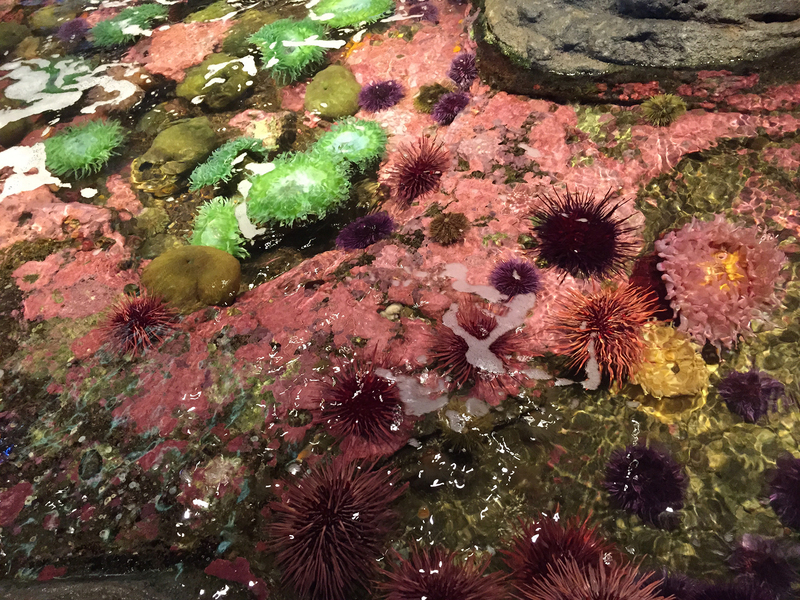 I visited the Seattle Aquarium recently, where visitors can get up-close and personal with the coral and urchins in a shallow exhibit pool. Yes – these are really the natural colors. Remember – after petting the animals – wash your hands!